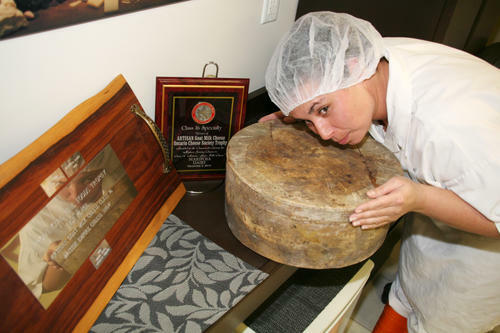 Lori Legacey, cheesemaker at Mariposa Dairy, has a sniff of a 19-kilo wheel of cheddar. The dairy's Lindsay Bandage Cheddar beat out 40 other goat-milk cheeses in the British Empire Cheese Competition. Photo by Lisa Gervais/The Lindsay Post. The Alexis De Portneuf division of cheese giant Saputo was crowned Grand Champion. Quebec cheesemaker Fromagerie La Vache à Maillotte was named Reserve Champion. Fifth Town Artisan Cheese, an artisan cheesemaker in Ontario’s Prince Edward County, was honoured with the Finica Food Specialties Award. In the cheddar class, Parmalat Canada was recognized as Grand Champion. Reserve Champion honours went to Fromagerie Isle-aux-Grues. Glengarry Fine Cheese, after an excellent showing at Royal Winter Fair, picked up several more awards at British Empire, as reported in Eastern Ontario AgriNews.